40" x 36" engine, 528hp; 9'6" x 18' tubular boiler, 45# steam by Globe Iron Works, Cleveland. 1 mi. s. of Whitefish Point; 1 mi. offshore. 1873, Aug 26 Ashore Presque Isle, Lake Huron; got off. 1873, Oct Sank Lake Superior, cargo of grain. 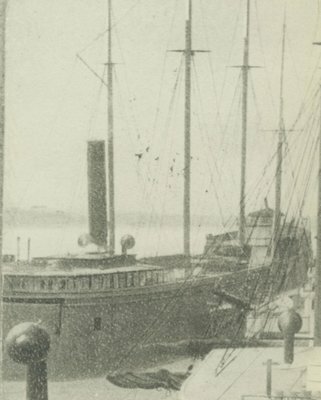 1875-76 Rebuilt; 2 decks, 3 masts; 1005.79 gross tons. 1883, Sep Willow St. bridge swung into her at Cleveland, OH; considerable damage. 1887, Jun 11 Stranded on uncharted 14' shoal, 1 1/2-2 mi. sw. of Waugashance Light, Straits of Mackinaw; tug LEVIATHAN assisted. 1889, Mar 11 Owned Orient Transportation Co., Rockport, OH. 1890, Mar 20 Change rig to 2 decks, 2 masts. 1892, Sep 16 Sunk in collision Lake Superior. 1892, Sep 28 Enrollment surrendered Cleveland, OH. 1974 Discovered by scuba divers Kent Bellrichard & Tom Farnquist; many artifacts recovered.